A new 600-seat performing arts theater is being constructed within a former test tower of an existing building. New column footings and a sloped floor slab will be up to 8 feet below the existing finished floor elevation. The entirely new steel support structure within the existing tower space will be exposed and highlighted. In addition to the elements found in many theaters, catwalks, light towers, an elevated control room and followspot platform, there will be a cantilevered balcony, as well as a ceiling level that will clear span the entire 68 foot width of the tower space. An existing 100 ton air handling unit will be relocated from a mezzanine in the tower to a platform above the ceiling to serve the theater space, while a new air handling unit will be installed below the roof backstage to serve the stage itself. The fly tower; rigging support steel and gridiron platform, fit nicely below the existing roof structure, and will be entirely supported by the large existing building columns. There will be adequate space for rigging, with room for more than 30 electric hoists in this state-of-the-art theater. The backstage will occupy the existing loading dock and warehouse areas. 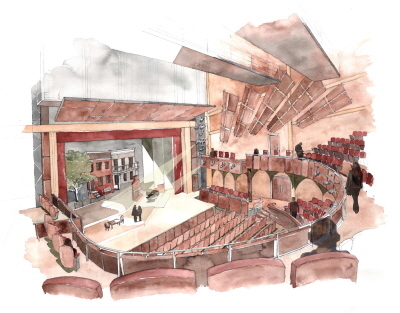 The space will be completely remodeled and enlarged by close to 7000 square feet to house theater classrooms and professor offices, a scene shop and scene storage, dressing rooms and costume storage and other support areas.